Imagine a world without SUGAR! Podero lives that truth in his home town, Darae. A long-ago war cut off the villagers' supply of sugar, but something magical happens when Filgard the wizard comes to town. He makes Podero's wish for sweets come true in a most unexpected way by giving Darae a special gift, a tree that grows strange, never seen before goodies. Sweets that bring to life all their happy, exhilarating memories. That's when Podero starts believing in magic. 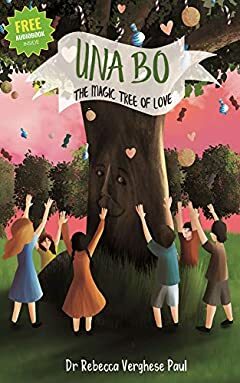 The villagers soon learn that the tree does much more than just grow sweets. They start calling the tree Una Bo or the Tree of Love. And She is a tree that knows and shows love. Read on to see how she touches lives and makes dreams come true. When a terrible danger comes to the village can Una Bo save them? How far can her love really go? Get ready to go on a magical journey of learning to give, pursuing dreams and growing up.